One of the great paradoxes of being competent at something is the willingness to be temporarily incompetent at it first. I am often perceived as an expert, teacher or mentor. I find this perception others have of me quite ironic because day-to-day all I ever feel like is a student that’s constantly learning. Anything I’ve ever been competent at in my life, I was incompetent at it first. This has been the secret to my success. It is also the secret to anyone’s success. To be good at something, you must be willing to first be bad at it. This is the competence / incompetence paradox. While this seems like common sense, there’s a nuance to this paradox that’s important to grasp that most people miss. Most people so dislike the feeling of incompetence that they avoid situations that are new and unfamiliar. If you never try, you will never fail. It is the willingness and desire to be in situations that stretch the limits of your capabilities that allow you to grow. I find myself doing this in many facets of my life. In some quarters, I stretch my career skills. In other quarters, I stretch my physical abilities, my parenting skills, or my interpersonal relationship capabilities. What I’ve noticed about myself is that I’m always stretching in some facet of my life... ALWAYS. Recently I spent a week traveling in Central and South America on my own. It was my first time visiting these areas. I took the subway, the bus, and taxis around Panama City and Medellin, Colombia. The last time I spoke any Spanish beyond ordering food off a menu was when I was 16 years old in high school. Needless to say, that was a long time ago. Rather than take a guided tour, I prefer roaming around foreign cities intentionally getting lost while learning to do everyday things. In Panama, I wanted to go to a local shopping mall to see a movie. I figured out the subway system. I had to buy a metro card, which I was told cost $2. I did my best to navigate the kiosk machine to buy the card, but when I tried to use it, it wouldn’t work. The security guard said I had no money left on the card. Apparently, the $2 I spent was for the card itself, not for any subway fares. This is different than how the subway cards in New York City work. I felt a little foolish holding up the five people behind me during rush hour. In other words, I felt incompetent. But I LEARNED from my mistake and did find my way to the movie theater at the local mall. Somehow, I managed to order tickets for an IMAX 3-D movie. Unlike most theaters in the United States, the one I went to in Panama works on a reserved seating basis — like an airline. I could see the screen showing which seats were available and which were taken. I got the colors confused and requested a seat that was taken. Whoops... I felt incompetent. After feeling a little embarrassed, I LEARNED from my mistake and was finally able to order a ticket. You can see it here. All this took place over a few hours one day of my trip. This stumbling around, making mistakes constantly and feeling incompetent continued in a similar way for ten days straight. After returning to the U.S., I noticed a different feeling I had. I noticed that I felt more comfortable traveling in a Spanish-speaking country. I felt more confident that I could get by and figure things out. In other words, I felt less incompetent and slightly more competent. This is the journey towards competence. This is how you develop skills. And here’s the thing. The things I feel incompetent at will be different than the things you feel incompetent at. 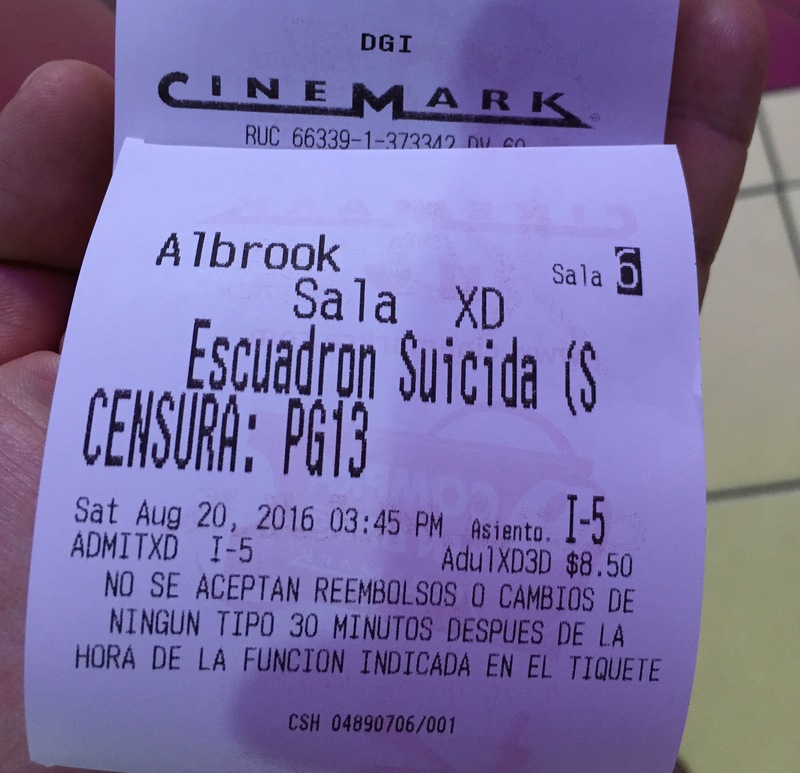 For many of you, going to see a movie in Spanish is something you’ve done your entire life. It is not a big deal. For me, it was a huge deal. In two months, I will be running my first obstacle course race known as the Spartan Race. If you’re a current or former member of any military, an obstacle course is no big deal for you. But climbing up ropes, scaling walls and jumping over fire pits is a huge deal for me. I’m nervous. I’m slightly intimidated. I’m concerned my training won’t be enough given the time I have left. We each have our areas that are opportunities to grow. My message here is: learn to be comfortable being uncomfortable. This is how we all grow. Many years ago, I wasn’t focused on watching movies in Spanish or running obstacle course races. Back then, all I wanted to learn was this thing I had just discovered called the case interview. To be competent at something new, you must be willing to be incompetent first. Everything else is an extension of this principle. What are you incompetent at in your life right now? If the answer is nothing, chances are you aren’t growing. That’s my thought for today. Victor, that’s some really good advice backed by beautiful anecdotes. Thanks for sharing.